The NVIDIA Tegra K1 (Tegra 5) is an ARM-based SoC (System on a Chip) made largely for high-end Android tablets and smartphones. Its main features include an integrated five ARM Cortex A15 cores (4+1), a Kepler-based graphics card with 192 CUDA cores, a dual-channel 64-bit memory controller (up to 4 GB), video codecs for encoding and decoding up to 4k content and dual ISP. It is built at TSMC under a 28nm HPM process for improved peak performance (in contrast to the 28nm HPL process of Tegra 4 which is optimized for low leakage). 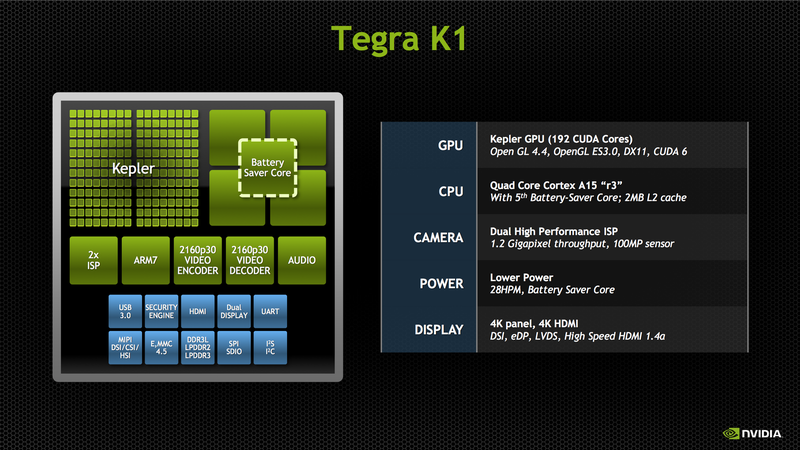 Later in 2014, Nvidia will introduce a second version of Tegra K1 with two "Denver" cores at up to 2.5 GHz. Similar to Apples "Cyclone", Denver is alredy 64-bit capable (ARMv8) and has been developed by Nvidia itself. 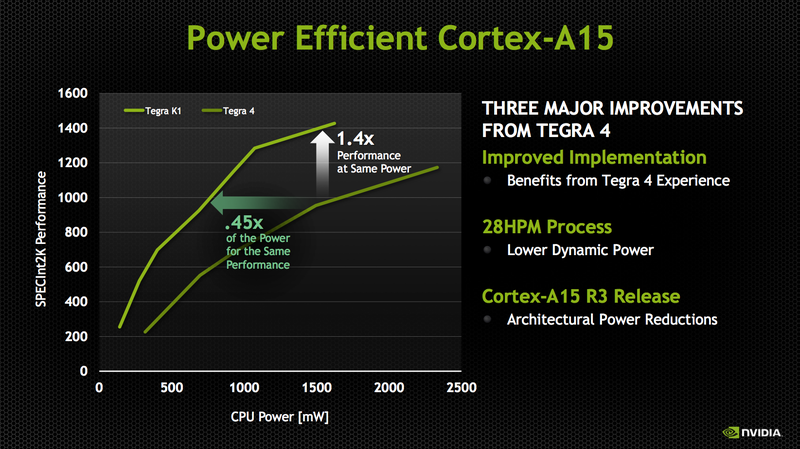 Especially the per-core performance should be significantly above the Cortex-A15 model. 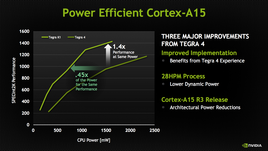 As with the Tegra 4, NVIDIA uses four ARM Cortex A15 cores as the main processing power for the Tegra K1. In addition to this, a further lower-clocked "companion core" is used to save power. 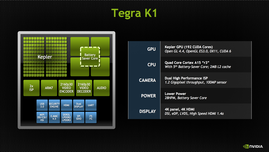 Compared to the Tegra 4, Tegra K1 uses a newer revision of the A15 architecture (r3) and clocks the main cores up to 2.3 GHz - much higher than the 1.8 GHz or 1.9 GHz Tegra 4. 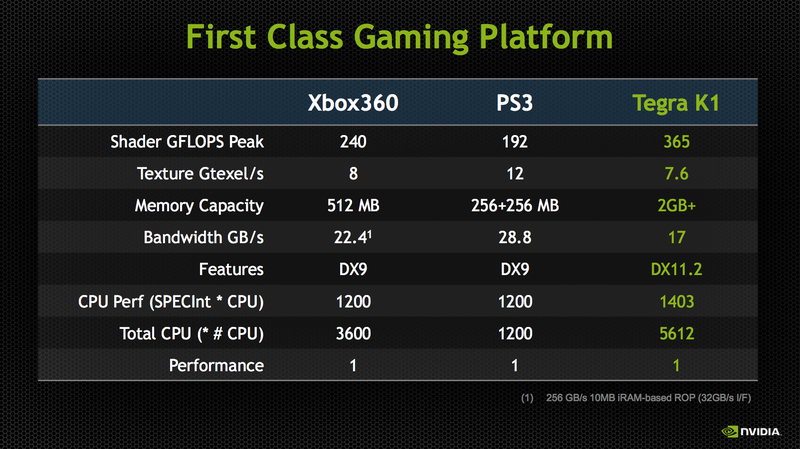 Furthermore, NVIDIA claims up to 40% more performance at the same power compared to the previous generation. The companion core can run up to 1 GHz independently from the 4 main cores, but is typically clocked at 500 MHz for lower consumption. It is used only for power-saving purposes and not for additional performance. 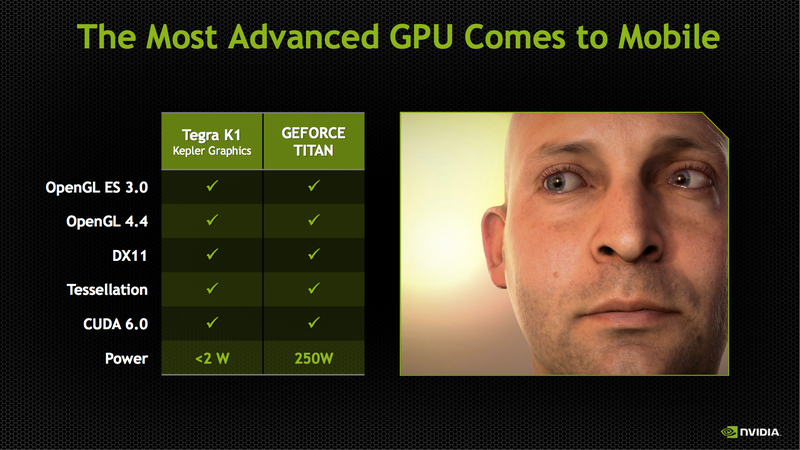 The integrated graphics card has received the most significant upgrade in the Tegra K1 chipset. Nvidia has finally made the move to a unified shader architecture. It integrates a full-featured Kepler-based graphics card that includes a single SMX with 192 CUDA cores, 8 TMUs and 4 ROPs. 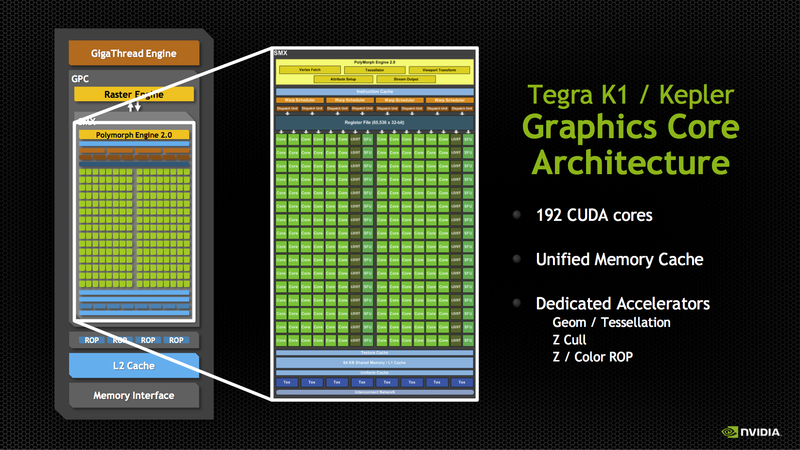 Therefore, Tegra K1 offers about half the power of a GK208 chip (384 shaders, 32 TMUs, 8 ROPs) such as a GeForce GT 730M or 740M. This is a big step forward compared to the GeForce ULP in the Tegra 4 SoC, which was based on an old architecture with dedicated pixel- and vertex shaders that is similar to the GeForce 6 series of 2004 and supported only OpenGL ES 2.0. The new graphics card supports OpenGL 4.4 and DirectX 11 in hardware, or well above the current OpenGL ES 3.0 standard that is most common amongst the majority of mobile operating systems. 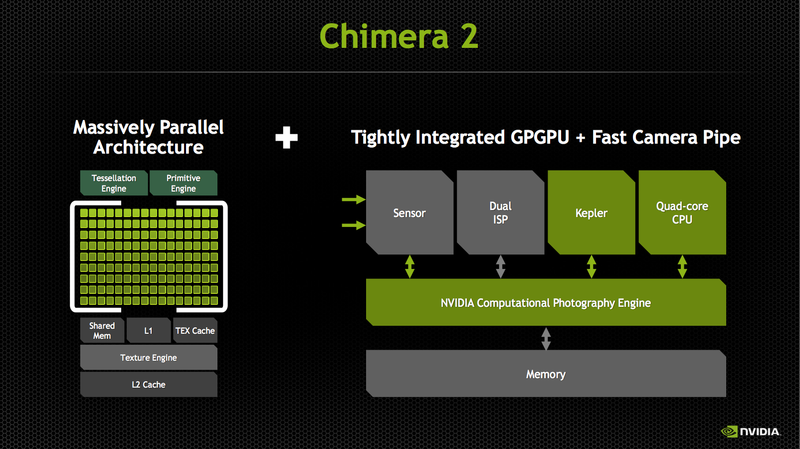 Furthermore, the Kepler GPU can be used for general calculations using CUDA and OpenCL 1.1 (1.2 in theory). 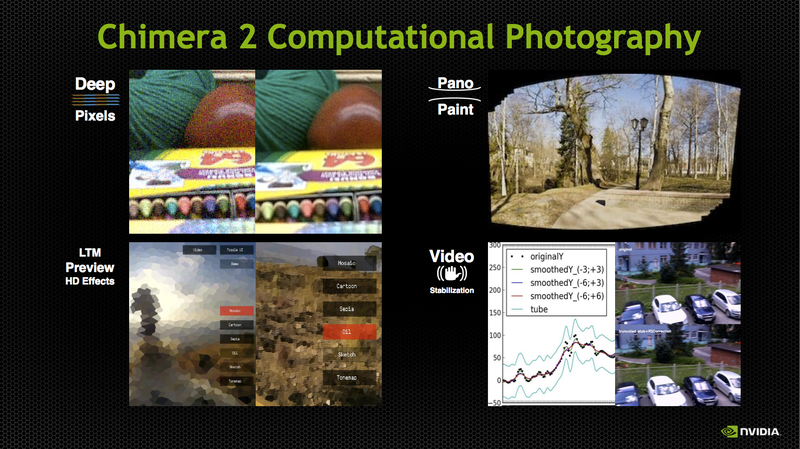 As an example, Nvidia has shown how to perform real time video effects using the GPU and CUDA (Chimera 2). 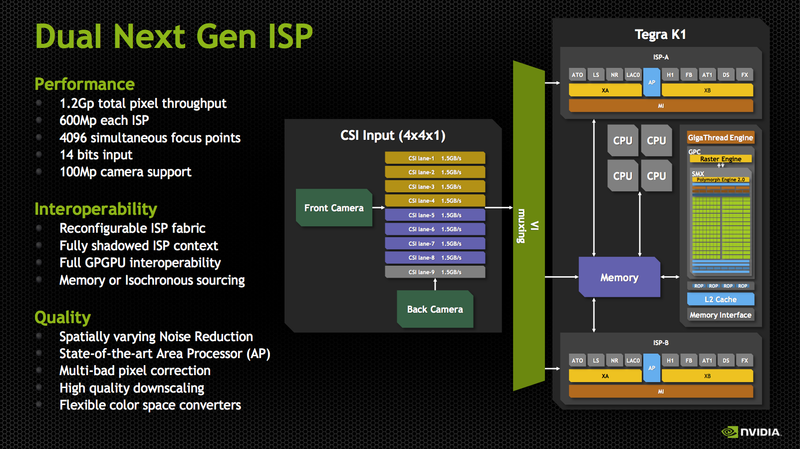 To drive two independent cameras, Tegra K1 integrates a dual ISP with 600 Mp each. Both ISP support cameras with up to 100 Mp and 14-bit input. 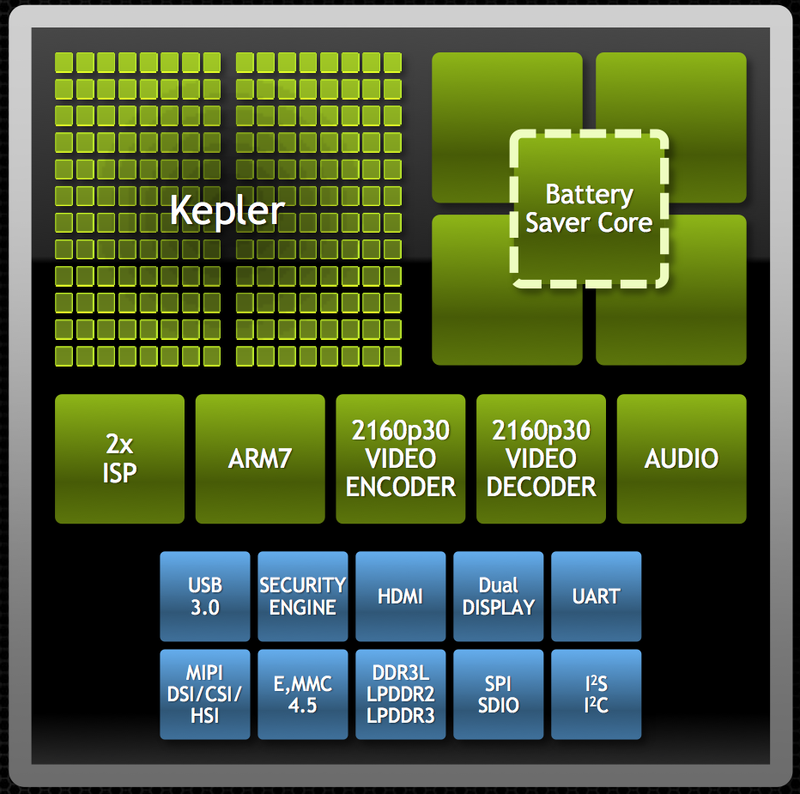 The integrated video engine of Tegra K1 is advertised as 2K and 4K-capable for hardware video encoding/decoding. According to Nvidia, the SoC most likely requires processing assistance from additional CPU cores for 4K content. 4K can be decoded at 30 fps and encoded at 24 fps. 1080p videos on the other hand can be decoded with up to 120 fps and encoded with 60 fps. Nvidia claims to outperform all current high-end competitors like the Apple A7, Qualcomm Snapdragon 800 and Samsung Exynos in processor and graphics card performance. In our benchmarks, Tegra K1 offers a performance similar to the Apple A8 and Qualcomm Snapdragon 805. While the A8 wins most single-threaded benchmarks (e.g. browsing tests), the quad-core Tegra and Snapdragon SoCs take the lead in multi-threaded tests. However, both Apple A8 and Snapdragon 805 can also be found in smartphones, whereas the more power-hungry Tegra K1 is mainly intended for tablets. The integrated GPU is one of the most impressive features of Tegra K1, as it implements a full version of the Kepler core that is found from laptops up to supercomputers. Nvidia's 8-inch Tablet Shield manages to render about 66 fps in GFXBench 2.7 (T-Rex offscreen), more than four times the score of the previous Tegra 4. Compared to the PowerVR GX6450 (Apple A8) and Adreno 420 (Snapdragon 805), Tegra K1 takes the lead by more than 50 percent. 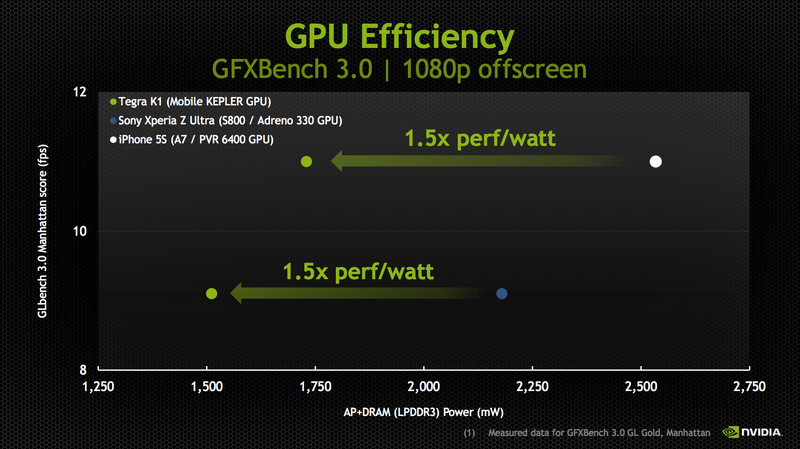 Furthermore, Nvidia's tablet SoC is even faster than the Intel HD Graphics 4400 found in serveral note- and ultrabooks. 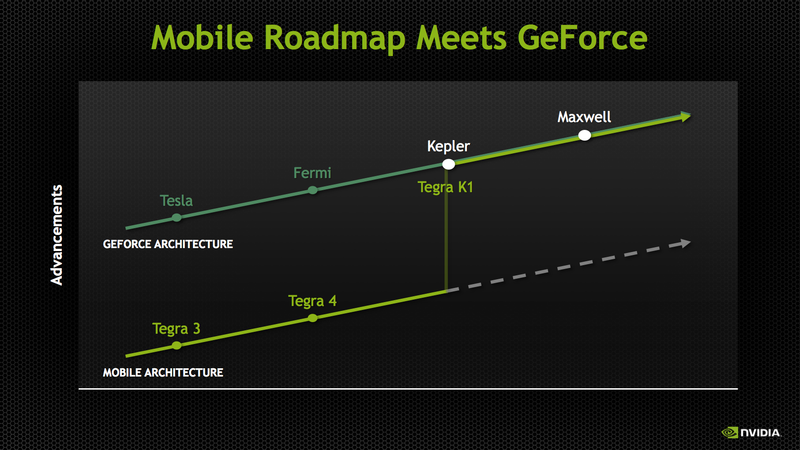 Combined with the advanced feature set that exceed the current Android standard OpenGL ES 3.0 (including Tessellation, Geometry Shading, ASTC Texture Compression, ...), Tegra K1 promises to be a serious mobile gaming platform. However, the competing Snapdragon 805 also supports DirectX 11 and therefore a similar feature set. Compared to the previous generation of gaming consoles (PS3 and XBox 360), Tegra K1 could offer similar CPU performance and better GPU performance. However, console developers are quite skilled at optimizing the games for the hardware and gaming on Android and IOS is still evolving. 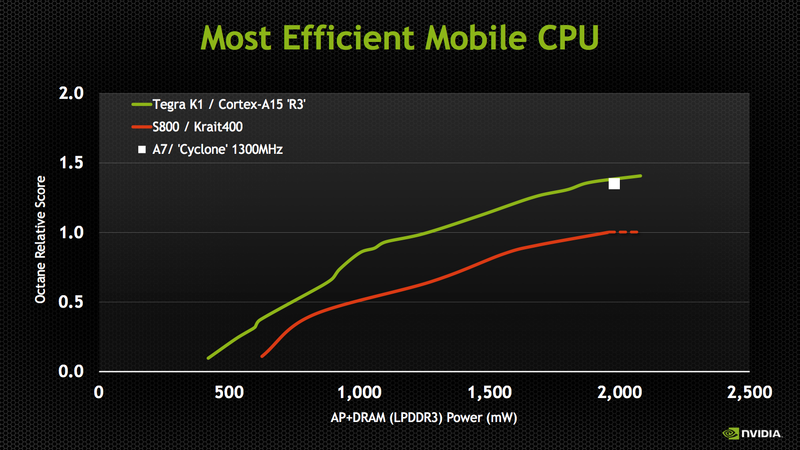 Nvidia emphasized the power efficiency of the Tegra K1 SoC in their presentation. Processor and graphics card should be able to beat the (tablet) competition on all power levels according to Nvidia. The TDP for the entire chip is rated at 5 W, however the slides did not mention any reference to the clock rate. It is very likely that a smartphone using Tegra K1 will be significantly slower due to thermal restrictions. One of the first devices using Tegra K1 is the Nvidia Shield Tablet. In addition, Tegra K1 can be found in the Xiaomi MiPad as well as serveral car infotainment systems.